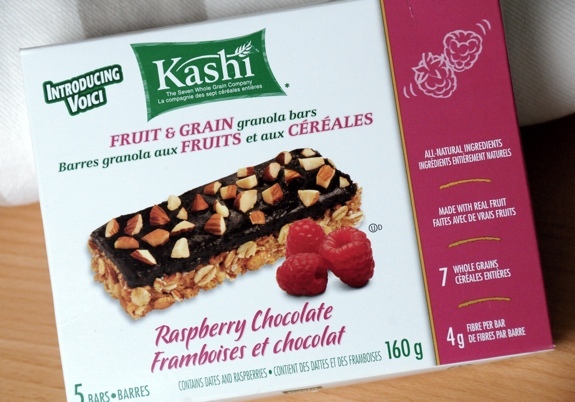 Kashi Raspberry Chocolate granola bars, as seen in their box. 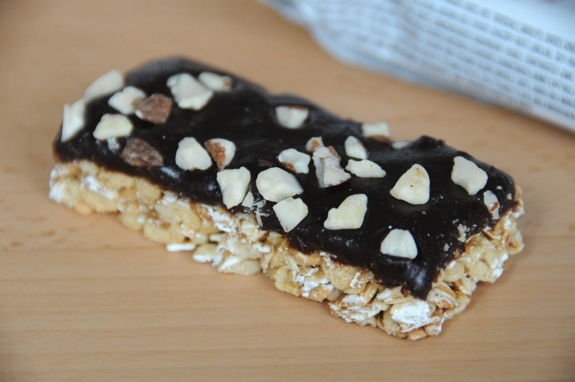 A whole lot of granola bars are little more than glorified chocolate bars sold with a healthy spin designed to make parents feel better about sending their kid to school with a lump of sugar wrapped in foil plastic. The other granola bar camp tries so hard to appeal to the health-conscious that they fail to be much fun at all. Kashi has found a happy meeting point between those two extremes with their Fruit and Grain Raspberry Chocolate granola bars. The bars combine whole-grain goodness with tastes-goodness, leading to a treat that helps meet afternoon snacking requirements without leading to an immediate bout of snacker’s remorse. The bottom layer is made up of grains, compressed together like chip-board with the help of a sweet binder. The top layer is a soft, fudgy raspberry-date chocolate, with chunks of almond embedded in the surface. The texture is nice, with the smooth chocolate top contrasting the crunchy, grainy bottom. The raspberry flavour isn’t fake or overpowering. It’s not too sweet, and not too salty. The real victory, however, is that it’s the sort of occasional lunch-bag treat that should satisfy parents while making kids think they’re getting away with something. The bottom layer is made of compressed, sweetened grains. The top layer is chocolate-raspberry-date fudge, with nuts sprinkled on top. They look pretty damned good. Value for cash money: Not too bad, especially if you can find it on sale. At $0.76 per bar, it’s reasonable. Availability: Health food aisles, certainly. Kashi products aren’t hard to find in regular grocery stores, either. Nutrition? : For a granola bar, none too bad. At 130 calories, it’s about half what you’d get from a chocolate bar, and there’s some fibre (4 grams) and iron thrown into the mix. The verdict: A whole lot better than a lot of granola bars I’ve tasted, and not as nutritionally useless as a chocolate bar. I’m going to call that a win.